After assembling the inlet/outlet pipes in the tank, the pvc fitting that keeps the two flows apart was attached in the cabinet, this has a out-flow that falls onto the filter sponges in the first section of the sump and then the return was connected to the pump in the third section to complete the circuit. 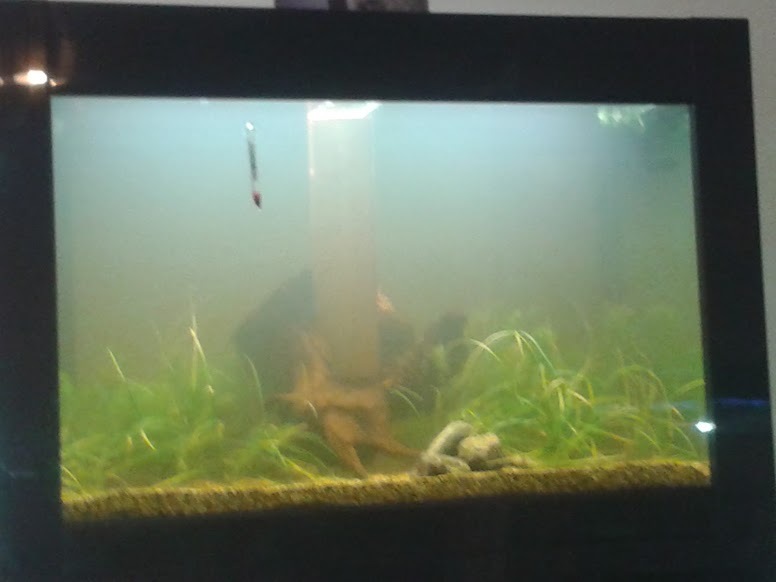 Onto the installation of the filter media, I did seek some advice just to confirm my earlier thoughts about positioning of the various media in the sump tank. and in the last section I have the heater and the return pump. The method I use is to put some kind of container in the tank on top of the gravel and pour water into that, this prevents the water displacing the gravel as you fill the tank. Over the next few days I added water using a 2 litre plastic milk bottle, pausing for a few hours just to confirm there were no leaks, once I was happy a very good friend came in and helped with the final fill, which had already taken about 4 days and took a few more hours of me stood on a step stool and my friend running back and forth will the fertiliser buckets full of water. The following day it looked like this, again the photograph is not that good due to lighting difficulties, but you can still tell that it was very cloudy indeed. I added some plants at this stage to start the cycling process off, it stayed in roughly the same condition for a number of days. About 5 days later there was very visible progress, you will notice I have added some more plants, but what you cannot see is the 10 neons that are in there somewhere. Here you can see my trusty assistant checking the water for colour depth, using her green eyes as a colour match, a really nice algae bloom exploded into the tank overnight, turning the water a shade of green, this algae will provide food for the bacteria in the filter, the intention being that once the green has been cleared there will be a well established colony of good bacteria in the Alfagrog. I managed to get hold of a load of grass-like plant that looks really good, sadly it came with hitch-hikers, in the form of snails! This forced my hand as at this point I had two choices, leave the aquarium to cycle naturally, which would lead to a snail explosion as they too enjoy algae or step in with chemicals and fish in an attempt to ‘force’ the cycle, I chose the latter which meant dosing with API Prevent Algae and a team of snail killing professionals, namely 5 Clown Loaches. Boy did they make short work of the snails, when I put them in the tank everywhere you looked was snails, within a few hours I had to search to find a snail!! The dreaded enemy, I lost about 6 plants to these little beasties, they chewed through the roots of a few and slimed my carpeting plants to death. The next stage involves building and installing a CO2 system for the plants, that will be covered in part 5, remember to check back for updates.